I am very lucky to have lots of lovely friends who do all sorts of crafts who I have met over the years of going to embroidery and knitting groups. 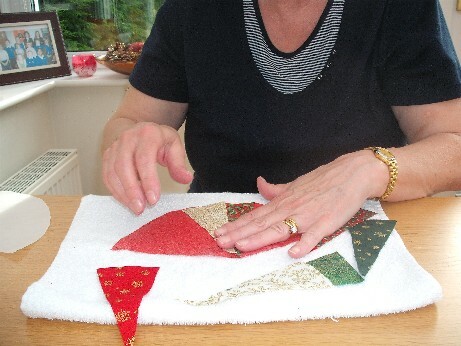 Recently one of them , the very talented Barbara, came for lunch and a crafting session. Barbara was the person who inspired me to do crazy patchwork with her amazing tea cosies and I have shown you some of her work before. She is a very creative stitcher and is always trying out new things. She does not have a blog but I will find out where you can see more of her work on Flickr and post the link. We had a lovely lunch and the got down to the serious business of exchanging fabric, ideas and having a little show and tell. 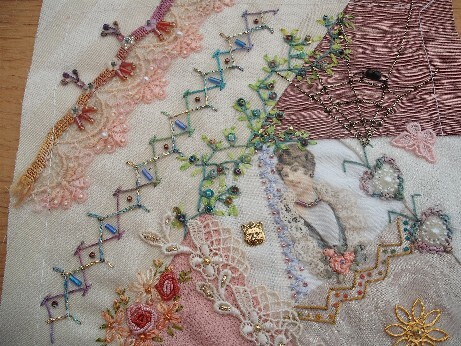 Barbara has been participating in some private exchanges with some other crafters that she has met through her Flickr site and had brought this wonderful Victorian inspired crazy patchwork piece to show me. Apologies I have forgotten the maker’s name (it may be Maggie) but I know she lives in Australia. Look at all that wonderful stitching and little charms! Barbara has been working on these techniques herself including printing pictures on to fabric and look what she brought me! The needlebook case on the left has gorgeous little rosebuds stitched after the picture and the little bag with me on is so clever! What I forgot to take a pic of was the bottom of the bag – she has lovely sparkly pink shoes all stitched in metallic thread and Barbara has written ‘girly shoes’ next to it – she is a fabulous machine stitcher and I am very, very pleased with my gifts. thank you again Barbara! 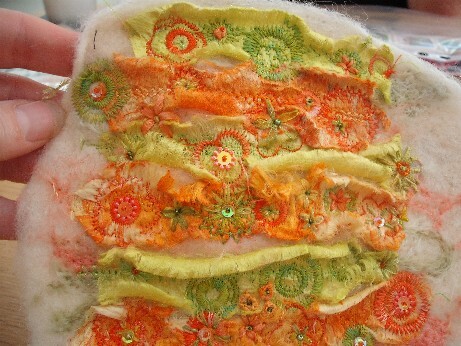 She also brought along a sample she has made using her new flower foot on her sewing machine. Aren’t the colours in this gorgeous – just what you need on all dull day – I told you she was clever! 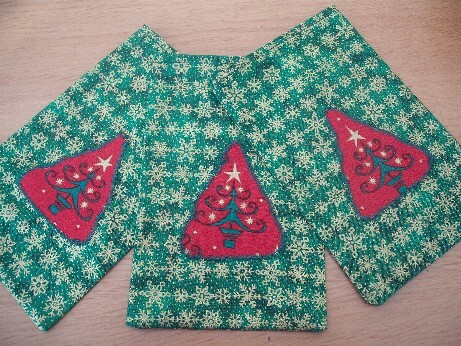 Barbara made a little tree ornament while she was here and we exchanged some Xmas fabrics – I have been cracking on this weekend with my Xmas crafts , have finished putting together the quilt wall hanging – now I just need to quilt it. 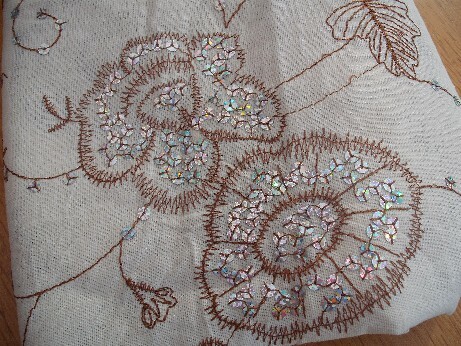 I was going to machine quilt most of it but don’t thick it will fit under the machine now the wadding is quite thick so will hand quilt in metallic thread instead. In the exchange I got some fabric with trees on so I have put it to good use and made some little bags for my craft fair stall – I also made 3 more with some robin fabric that I had in my stash – I have to get rid of some of the fabric to justify my expenditure at Harrogate you see! 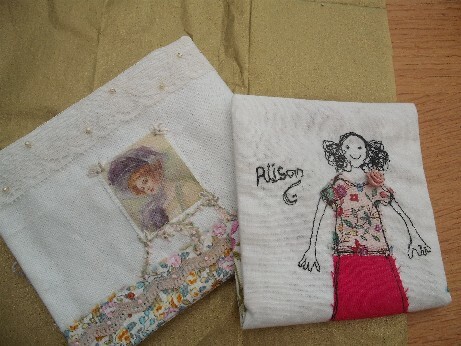 A couple of days later I got this lovely parcel in post from Barbara with even more fabric and some very cute charms which was very well received. 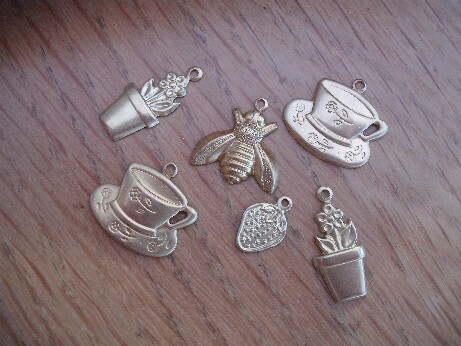 Need to think of somewhere to use these - look at the tea cups - very cute! I have finished and posted my second Autumn exchange – this one to Oklahoma in the USA – will post pics of both when they have been received. I managed to get to two of my knitting groups this week which was great – haven’t been for while to one during work and it wa so nice to see everyone again. All in all a wonderful week! And I am off to Spain tomorrow – yipee! Am packing lots of knitting to take with me hoping to finish off a couple of the Xmas gifts while I am away. Will post when I get back. Thank you for showcasing my work Alison – my friend in Oz is Maureen and she often looks at your blog. Have a good time in Spain and will email you later this week.